This image is so layered with enigmatic meaning that it’s kept art historians scratching their domes for centuries. Brainiacs are entranced. Famous philosopher/leather-daddy Michel Foucault wrote about it. Pablo Picasso created a whopping 58 reproductions of the scene and even wackjob Salvador Dali did a version where he replaced all the people with numbers. You can call it a self-portrait, a family portrait, a royal portrait, a scene of 17th century Spanish court life or just a really trippy picture that messes with the conventions of pictorial space. People judge it as Velasquez’s crowning glory in terms of what painting itself is able to achieve…but I like to judge famous paintings on their power to inspire parodies featuring the cast of The Simpsons. (Google it). The title means “maids of honor”, which refers to the ladies in waiting surrounding the little girl in the center who has been identified as Princess Margarita. Blended, no salt. Other members of her entourage are her favorite dwarves, a large dog, a woman in black and a Shakespeare-looking dude looming creepily in the distant doorway. Velasquez himself is featured in the foreground, painting upon a large canvas, with a killer ‘stache. The man with the money is always included and you can see King Philip and his wife hovering in what appears to be a mirror near the doorway. Or is it a painting in a painting? Inception! Little things like the reflections and doorways create visual extensions in the image that cause the viewer to swing between reality and illusion. Even though there’s nothing scandalous going on, I can’t help but feel a Big Brother-type sense of foreboding, as though I’m the one being watched instead of watching. Theorize with the masses in front of Velázquez's Maids of Honor. It wasn't even known as The Maids of Honor or Las Meninas until 1843. Previously used titles: The Family of Philip IV, The Royal Family, and Velázquez and the Royal Family. Jan van Eyck’s Arnolfini Portrait was in Phillip’s castle and Velázquez probably thought, “Cool mirror idea!” It also shows up in his Toilet of Venus (Rockeby Venus) at the National Gallery. The cross on Velázquez's shirt/smock wasn't added until sometime after 1659. It denotes that Velázquez is part of the Order of Santiago, which requires getting through a whole lot of red tape and a lot of friends to bear witness. The dwarves were Margaret’s “playmates”. There were no other children in the palace so little people were used as pint-sized company for royal children. One of them lovingly abuses the pet dog. And if you think little Miss Margarita is a little off looking, it’s just the unfortunate facial structure she inherited from her father. Those Phillip Habsburgs were lookers! Maybe Jay Leno and Rumer Willis are distant relations? It was damaged, but also saved, when it was tossed from a window when the Alcazar (original Palacio Real) burned down in 1734. Now it resides center stage in El Museo Nacional del Prado but beware of the many large groups who want to theorize with their audio guides. Because of all these visitors and pollution the painting gets dirty pretty fast. The last time it was cleaned (way back in 1983) people threw a hissy fit because conservators removed a layer of dirt and the yellow sheen it caused, which made the painting look different. Unfortunately, due to it's massive size (125.2 in × 108.7 in) and importance, Las Meninas will never be coming to a town near you; you'll have to visit it. Also, Picasso did a series of 58 versions of Las Meninas that can be seen in the Museu Picasso de Barcelona. And don’t you just love his epic stache!? 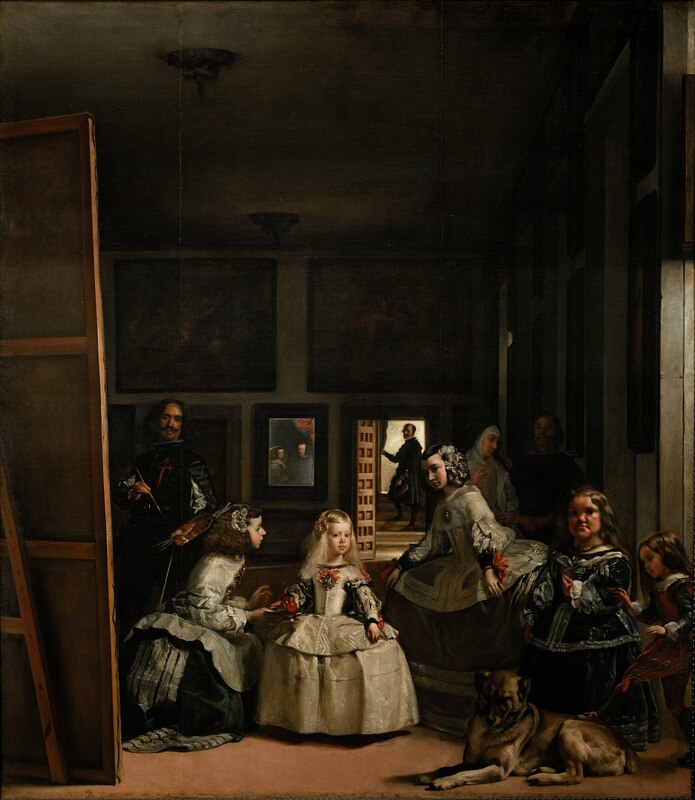 Check out the full Wikipedia article about Las Meninas. Very Meme. Such Tate. Wow.